According to the literature on the subject, poltergeist activity can be traced all the way back beyond 530 AD, appearing over a large cross section of cultures and generally exhibiting the same characteristics. But what is a poltergeist? 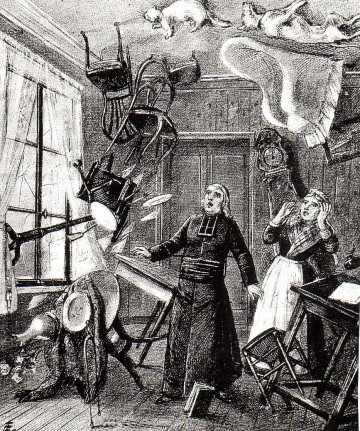 The term poltergeist, which actually means noisy spirit, was first coined by the Germans. A name attributed to the phenomena before the nineteenth century, when an alternative basis of the disturbance was hitherto unknown. Given the rudimentary understanding of the time and lacking the technology that we currently have today, the unknown disturbances were quickly attributed to demons, spirits, ghosts or gremlins. It was in the 1930′s that distinguished psychic researcher and psychologist Dr. Nandor Fodor, set forth the most popular theory; that poltergeist phenomena was not caused by ghosts but by individuals repressing intense emotions such as anger, hostility and sexual frustration. In 1938, his investigation of the Thornton Heath poltergeist helped to validate his theory and has since had much support from other research indicating that in a significant number of reported disturbances, the agent was a teenager or child possibly releasing rebellious hostility unconsciously from a stressful environment without the fear of being punished for it. It was this view that became known as the human agent poltergeist or HAP. 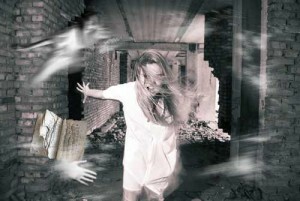 Today, the two main schools of thought on what poltergeists actually are seem to be either disembodied “entities” (such as spirits or demons) known as entity agent poltergeists (EAP), or the human agent poltergeist (HAP). Apparently, the manifestation from either is psychokinesis (PK), which is the activity of the mind affecting matter. Making a distinction of the cause or source of a poltergeist is definitely no easy task. Experiencing an actual poltergeist is enough to make an atheist an instant believer it would seem. However, it can also be said the distinction is often made by the type of individuals who are involved. In a religious household where religious items seem to be attacked, it is immediately classified as a demonic entity. In a household with a history of people dying in it, accidental or otherwise, it is often classified as a spirit or ghost. In a household with scientifically unbiased researchers, it would likely be classified as a projected repression situation or PK via an adolescent agent in the household. The current poltergeist theory to making a distinction between HAP and EAP activity is by the “antics” involved. If accounts of such phenomena can be trusted, “Entity” poltergeists are believed to have greater repertoires. The appearance of fires, water, moving of heavy objects, the appearance of an intelligence of their own, and they usually don’t center on a specific person. These are said to be the telltale antics of an EAP. Human agent poltergeists are believed to be limited to tapping sounds, affecting electrical items and moving objects. The occurrences are active only when the person is present and supposedly do not exceed the physical abilities of the person or agent. William Roll, one of the leading poltergeist experts, coined the term “recurrent spontaneous psychokinesis” (RSPK) for this type of phenomena since it also tends to inexplicably recur around the agent. Often there is a psychological profile for these agents put together at the time of the investigation or, wiser, before it. What you do not usually hear on TV programs such as Ghost Hunters is psychological profiles of agents show that personality disorders, obsessive behavior, mental and emotional stress, phobias and schizophrenia are linked to supposed poltergeist phenomena, and in some cases, psychotherapy has eliminated the poltergeist disturbances. Research at the Rhine Research Center Institute for Parapsychology at Duke University reveals poltergeist activity to be the physical expression of psychological trauma. However, there are millions of frustrated adolescents in abhorrent situations all over the world and they do not develop into poltergeist situations. Moreover, there are also many poltergeist cases where there are no inherent psychological problems and no adolescents in the household. How can this be explained? Some researchers suggest that ‘spirit entities’ are responsible for the phenomena, possibly by connecting to suitably disturbed teenagers to generate a strong psychokinetic effect. However, hypothetical ‘spirits’ cannot be scientifically investigated. A few natural explanations are; Electromagnetic Interference (EMI), a causative factor allegedly behind a poltergeist case investigated by Midlands (UK) investigation group Parasearch. There is evidence to show that EMI could explain many more cases. According to paranormal researcher Albert Budden B.Ed., electromagnetic pollution via tall radio masts transmitting line-of-sight microwave signals, can cause many poltergeist effects when erected near certain homes. The effects may become worse over time with long or repeated exposure. It is also theorized, homes that are built near or with any limestone may be particularly poltergeist prone as limestone can affect PK, perhaps due to the quartz constituent. Naturally running water is believed to be yet another source of PK activity. Could the presence of any or all of these causative agents, or lack thereof, explain why poltergeists do not consistently manifest in every stressful or traumatic situation? Could the right person (susceptible to PK), in the right place (an EMI or electromagnetically polluted home), at the right time (a particularly stressful experience), be all that is needed to generate a violent poltergeist? As simplistic as it may sound, it may not be an entirely far-fetched recipe. Some of the documented Hutchison effects are; objects of various materials levitating into the air or moving about and then falling, fires appearing in unlikely places, and from a distance of 80 feet away, a mirror smashed. Solid metal also distorted, broke, or became white hot but didn’t burn any surrounding materials, water swirled in containers and strange lights appeared in the air and suddenly vanished. There are of course skeptics and scientists who assert that all poltergeist activity that they can’t prove as fraud, are either self-delusion or pseudo-psychic phenomena. For instance, under some circumstances they believe poltergeists are caused by scientifically explained obscure physical effects such as electromagnetic fields, static electricity, ionized air, abnormal air currents, underground tremors or infra and ultra-sound. It seems for every answer presented about the poltergeist mystery that is uncovered or theorized, a new question or possibility emerges. Perhaps there isn’t a single explanation that can categorically explain what a poltergeist truly is. Perhaps religious fundamentalist are correct and we are being deceived by demons. Alternatively, maybe those who advocate an entity agent poltergeist are correct and we are experiencing proof of an afterlife via spirits or ghosts. Or perhaps, we are stumbling onto an obscure source of untapped natural human potential, a source that may one day become as commonplace as any of our five physical senses, in a more civilized future society. Hey! That's not Paranormal! What is Carrie thinking? !